Cycles of creation & destruction in a cartoon. It seems that when adults write about watching “Phineas & Ferb”, a Disney animated series produced by Dan Povenmire and Jeff Marsh from February 2008 (Wikipedia November 2012) they generally make a category entitlement of “watching it with my children”.Well, I'm a thirty something year old male who once woke up one Saturday morning and switched on the TV and accidentally watched “Phineas & Ferb” and was surprised at how easy it was to watch. It seems to have fairly high production values, much of the humour involves wordplay and misapplying plot rules it creates over time and some of it is quite sophisticated for a kids show. So you may enquire “Aren't you too old to watch a Saturday morning kid's cartoon?” and I would respond “Yes, yes I am”. I was wondering if there was any academic work on what I was watching. So far, I have found a journal article by Kit Johnson (Johnson 2012) that uses "Attack of the 50 Foot Sister", Season 2 Episode 3 as its insipiration for its title. The article studies fashion model visas. In the episode Candace rejects an offer of a modelling contract because it is "nothing more than a plot to make money by encouraging people to feel bad about themselves" (Johnson 2012 : 863). Two web articles of note on this topic are Matthew Belinke's Myopia of Childhood and Margaret O'Connell's The Mildly Mad Scientific World of Phineas and Ferb. Matthew Belinke in Myopia of Childhood argues that the world view of the cartoon is the world view of children but differs from a common plot in children's cartoons where the children know more of the big picture than adults as part of a fulfilment fantasy of outsmarting the adults (Belinke 2011). He argues that there are multiple worlds revolving around each other in the cartoon and that the kids manifest a childlike myopia in which they let the world take care of itself and focus on having fun (Belinke 2011), which is not a bad value orientation for its intended audience. Margaret O'Connell in The Mildly Mad Scientific World of Phineas and Ferb contrasts the female characters in this cartoon to the female characters in the 1997- 2003 cartoon Dexter's Laboratory and finds that the female characters portrayed in Phineas & Ferb are generally more intelligent, complex and sympathetic characters (O'Connell 2012). As a kids cartoon it has a high degree of predictability in the plot, in fact much of the humour is based around the consistent plot structure and the characters awareness of this, the characters almost break the third wall but not quite. The cleverness of the show is how each episode is a variation of recurring plot structure elements. Phineas and Ferb are step brothers whose genius level intellects complement each other to enable them to create fantastic technological creations, and Candace is their older step sister. Phineas and Ferb work out what they are going to do today (think of Pinky and the Brain, “What will we do today Pinky?” “Today we will try to take over the world!”). Candace their older sister tries to find out what they are up to so she can bust them. Phineas & Ferb meet their friends, Isabella, Baljeet & Buford. Isabella has a crush on Phineas and always asks “What ch'ya doing?”. They begin their project with their friends helping. Perry the platypus finds a secret entrance to his spy base. Phineas & Ferb ask “Where's Perry?”. Perry the platypus gets given his mission for the day by Major Monogram (“I'm Major Monogram, I'm on the big screen, I'm Major Monogram and I wear green” sung to the tune of the Man from UNCLE theme song). Doofenshmirtz is always building a machine that is designated by what it does, a verb- inator, with the object of “taking over the tri-state area”. It is never “take over the world” and in several episodes he specifically states “you can't rule over the tri-state area if you destroy it” to other allies who don't get his objective. Part of the motivation for this is that Doofenshmirtz has a more successful, good looking brother who is the mayor of the “tri-state area” and Doofenshmirtz is jealous. In an episode Doofenshmirtz is trying to identify why he is always failing he recognises the common element, he is always building an “inator” so the next machine he has built is a “non-inator” (Series 3 Episode 3. Phineas's Birthday Clip O Rama). Hilarious. The thing Phineas & Ferb create is always cool and fun and often epic in scale, thus obviously worth the attention of the boys mother and so Candace spends time trying to get the attention of the mother, who is called “Linda”. Perry the Platypus gets caught in Doofenshmirtz's trap, Perry breaks out, something clever happens and Perry defeats Doofenshmirtz's scheme. Linda the mother treats Candace as someone who has an obsessive compulsive disorder with regards to her brothers, and she probably does, she needs to “bust” her brothers. In season 2 episode 32 “The Best Lazy Day Ever” where her brothers take a rest, doing nothing bustable, it precipitates an existential crisis in Candace. Hilarious for a kids cartoon. Eventually in every episode Linda finally pays attention to Candace's entreaties and goes to look at what Phineas & Ferb are doing. Her experience of this is often a source of humor, is talked about as an issue with Candace and the mother tries to take steps to control this behaviour. For example, in Season 2 Episode 46, “Out of Toon” when Candace phones her mothers cell phone the answer phone message is “Please leave your psychotic rant about your brothers at the end of the beep”. When Linda, the mother, finally looks at what Fineas & Ferb have been doing it is always too late. Their project and all evidence of it is removed, often this is due indirectly to the destruction of Dr Doofenshmirtz's “inator” by Perry the Platypus. Sometimes it becomes a less mind boggling approximation of what Candace is describing. For example in Season 2 Episode 9 “Chez Platypus”, the step brothers build a restaurant, when Candace finally gets Linda to look, the restaurant has disappeared leaving only tables and chairs and thus it looks like the step brothers and their friends have been playing restaurant. There are generally two cycles of creation and destruction each episode. The boys in each episode are creating their project, it is like children playing but in the context of the cartoon what they make works to achieve fantastic results and it is fun. Candice the older sister is trying to police her brothers innocent creativity and invariably fails to obtain proof for the authority figure in the Phineas and Ferb cycle, which is Linda the mother. Their project invariably gets removed, destroyed or escapes by the time Linda the mother gets there to observe. 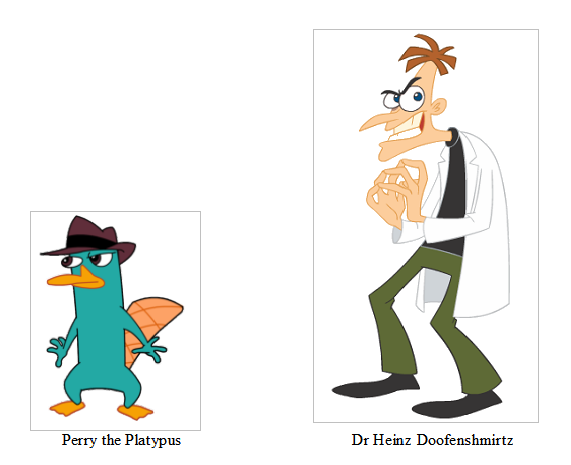 The second cycle of creation and destruction is between Perry the Platypus and Dr Doofenshmirtz, this is adults doing work, from a kids perspective (Belinke 2011). In this cycle Perry the Platypus is trying to police Dr Doofenshmirtz's machiavellian creativity. He is empowered by Major Monogram with the authority to police Dr Doofenshmirtz's creativity and succeeds, making the world safe. Once the scheme is foiled Perry returns to being Phineas and Ferb's pet at the end of the episode. Both Candace and Perry have "police" roles in the context of the cartoon but only Perry appears successful in his police role. Candace when she is not engaged in a policing role is often portrayed as obsessed with her relationship with Jeremy and doing teenage things with her friend Stacy. Her relationship with Jeremy is generally portrayed in a positive way and makes her a more sympathetic character as compared to simply being an antagonist. Thus there appears to be two entwined cycles in each episode, the innocent creativity of children which is unimpeded and the goal directed creativity of adults, which is impeded. I often wonder the degree that the world view of the episode writers intrudes, perhaps unintentionally into the episode. Images from Wikipedia November 2012. Adults as represented by a silent Platypus wearing a fedora and Dr Doofenshmirtz, a comic stereotype of an American German scientist. Ah well. These cycles are what is designated as plots and subplots by Margaret O'Connell (O'Connell 2012) and "multiple worlds revolving around each other" by Matthew Belinkie (Belinkie 2011). Belinkie, Matthew. (September 2011). Phineas and Ferb: The Myopia of Childhood. @ http://www.overthinkingit.com/2011/09/15/phineas-and-ferb . Last viewed 5-11-2012. Johnson, Kit. (2012). Importing The Flawless Girl. In the Nevada Law Journal. Volume 12. Pages 831 to 867. O'Connell, Margaret. (October 2012). Mad Science for Girls (and Boys), Part 2: The Mildly Mad Scientific World of Phineas and Ferb. Published by Sequential Tart @ http://www.sequentialtart.com/article.php?id=2316 . Last viewed 8-11-12. Wikipedia. (November 2012). Phineas and Ferb. @ http://en.wikipedia.org/wiki/Phineas_and_Ferb . Last viewed 8-11-12.